Words by RYAN SPARKS. Photos by ANNIELAURIE ERICKSON. AnnieLaurie Erickson is interested in capturing the things we have previously held to be fleeting and personal. All of us have experienced afterimages, the kaleidescopic and flashing color patterns that scour our eyelids even when we have physically shut our eyes off from light sources. These images are intangible and hard to convey, but Erickson, as she says in her artist statement, hopes to explore "how photography and science are capable of showing us things we thought we couldn't previously see." After moving to Louisiana, she was struck by the intricately engineered structures of oil and gas refineries that line the Mississippi River. 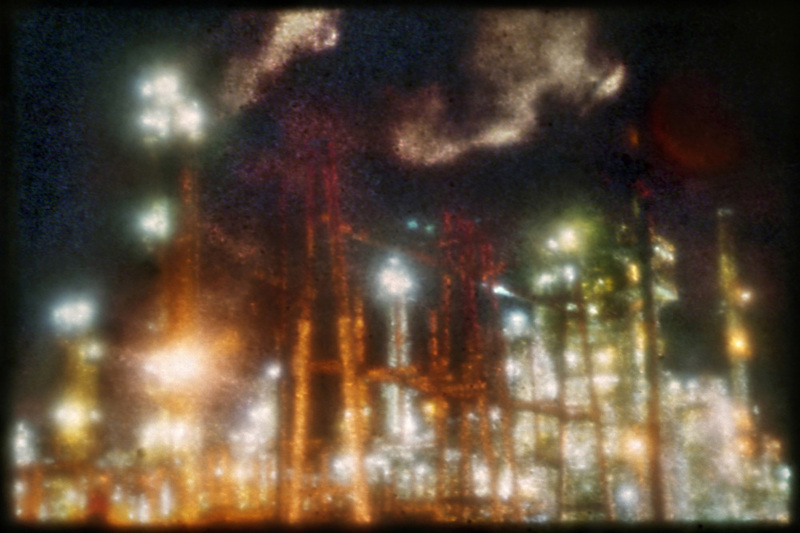 "Refineries are amazing feats of human development, but they are also symbolic of material excess and a troubled relationship to our environment, which may contribute to the impetus to take them on as subjects [...] At night, I find them to be stunning-mysterious cities of lights that are forbidden, alluring and otherworldly." These strange structures, unfamiliar to most but recognizable to most Louisiana residents who travel the river roads, are, legally "unphotographable" due to Homeland Security protocol. Despite being discouraged by police, Erickson kept coming back. 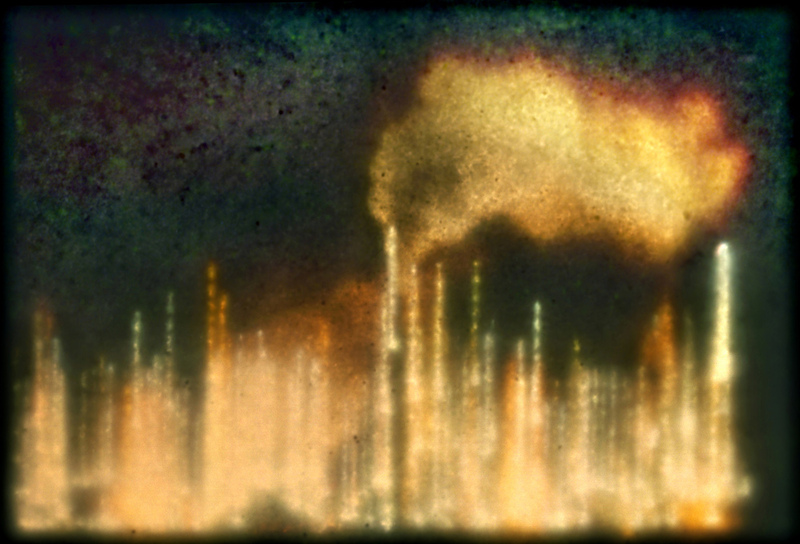 She was already experimenting with a new type of camera that could capture afterimages, and decided to use it surreptitiously to capture the gleaming refineries. "The first camera was very large and cumbersome to take out into the world. Since then, I’ve simplified the materials, but the essential part of the process remains the same: the lens focuses an image onto what I call an 'artificial retina' or 'retinal plate,' which is a membrane embedded with phosphorus materials that retain optical information. After an initial exposure onto the retinal plate, the optical information is shut off (much in the same way as an eyelid closing) but the image remains on the plate as a decaying emission of phosphorescence shifting in spectral content and form, allowing me to create a secondary exposure onto color film." The result are fantastic images of man-made shapes represented in otherworldly colors and style. Erickson does very little post-production on the images. "The colors are representative of what turned out on the film. Through the process of using different types of phosphorus materials and waiting various periods of time between the initial exposure and the secondary exposure onto the film, a range of color shifts can occur." Photographs from Erickson's Slow Light series will be on display at the Ogden Museum of Southern Art from December 12-January 5 as part of CURRENTS, its annual collaborative exhibition with PhotoNOLA. To see the full series online, visit Erickson's site.